Way of the Wicked binnen de Wereld der Magieck - 175 pagina's bekeken afgelopen 24 uur! a few dozen overworked soldiers who do their best to maintain patrols and a presence on the walls. Where Lake Scardynn meets the sea rises King Accarius’ other less famous building project. The lighthouse guides ships into the port through the jagged, rockstrewn breakwaters. It is also anchors one point of the great sea-chain that can be raised to block access to the Scardynn in times of war. This gently sloping hill is amongst the highest points south of the Scardynn delta and has become home to the wealthiest residents of Farholde. Access to the Green is blocked by a small private guard post. Without a pass granted by a residents, access is not allowed. Usually called simply the Abbey by locals, this large walled manor house is home to a devout order of Mitran nuns. The Order is well regarded throughout Farholde thanks to their many good works. Baron Arkov Vandermir established this orphanage obstensibly to help the most needy of Farholde’s children. In truth, the orphanage’s actual purpose is to give the Baron muscle. The older boys are taught to fight and steal. Those who excel at this brutality are eventually recruited into the Baron’s personal retinue. This gang of toughs does Arkov’s dirty work. The Orphanage itself is an imposing structure teeming with children of all ages. The buildings are well maintained and the children certainly seem well taken care of. This small watchtower just outside of Farholde rises on the highest promintory south of the Scardynn delta. It overlooks both the edge of the Caer Bryr and the lake. Manned by guards with piercing signal horns, it could alert the town if anything dangerous emerges from the woods. It has a very distinctive shape with two smaller turrets jutting out of the main tower, hence its nickname “The Trident”. One turret faces towards the river and one towards the forest. Built upon the largest of the nine hills, this is the oldest section of Farholde and the only part of the town surrounded by a wall. Today Auld’Irey is the mostly densely populated portion of Farholde. Every available plot has been developed and buildings are stacked upon buildings. 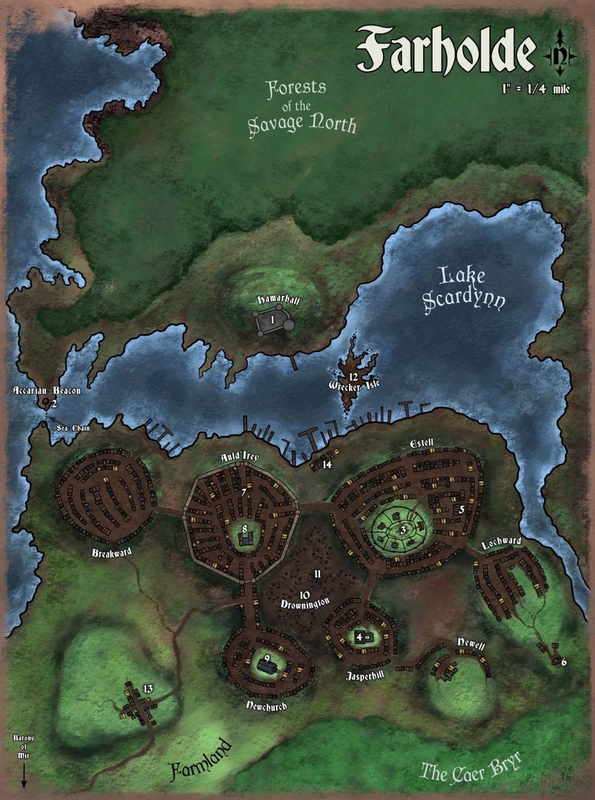 The majority of commerce is done here and the lionshare of Farholde’s shops, taverns and inns are located in this quarter. Located at the highest point in Auld’Irey is the center of all trade in Farholde -- the Templeton Rise. The building is an open hall where goods are traded in bulk. Various merchants maintain stalls where sellers can take their wares in hopes of finding a buyer. Newchurch is the name of the neighborhood, the hill it sits on and the common title given to the Mitran church at its center. The church itself, formally known as the Hall of the Sun Victorious, is perhaps the most majestic building in all of Farholde. It rises in baroque splendor to dominate its hill. Its great central spire, crowned with a Mitran sunburst, can be seen from almost any point in town. The church once had a large staff of clergy. Most of them are gone. This is the low-lying middle between Auld’Irey, Newchurch, Estell and Jasperhill. Being one of the lowest areas around the delta, no one sane would live here and yet it is crowded with temporary structures, water-logged shanties and traveller’s tents. This transient community is definitely the bad part of town. There is only one permanent structure in Drownington built on a slab of rock that is mostly above the flood line (by almost four inches!). There stands a stout stone bunker that has barely survived a hundred floods. A crudely made sign in front reads “Lord Drownington’s Manor”. Equal parts bar, brothel, fight club, black market and thieves’ guild, this is without a doubt the most dangerous place in Farholde. This large accumulation of pebbles and debris in the river delta is largely seen as navigation hazard these days. This low hill has a small rural community that marks the beginning of a collection of loosely affiliated farms that stretch south towards the Caer Bryr’s edge. Baron Arkov Vandermir owns a great deal of this farmland and thus possesses a near monopoly on Farholde’s food supply. He has used this to grow wealthy indeed. This is a large slab of stone built on the banks of the Scardynn almost two centuries ago. Though it was settled some, it remains comfortably above the flood line. Thus, it is completely filled with warehouses, businesses and offices of all sorts. It is also the home of the Harbormaster’s House. Gepost door Jeff op 28 oktober 2015 om 17:35 uur.